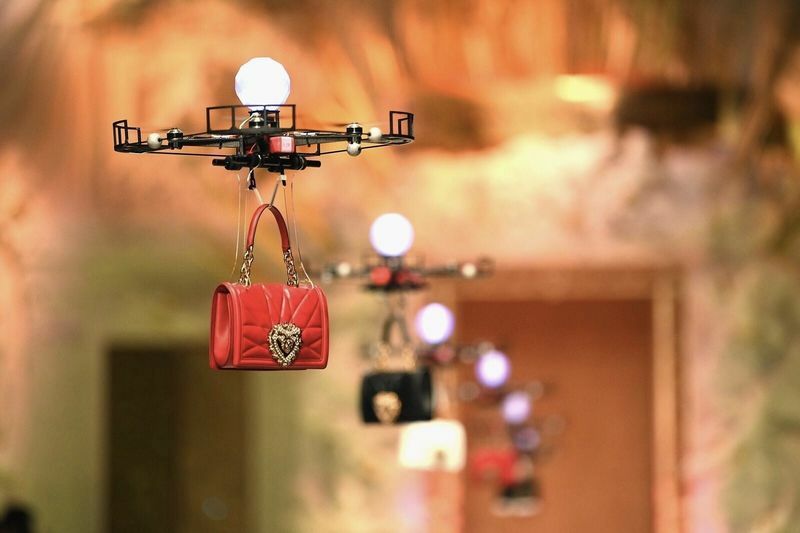 For about the first 3:30 minutes of the video below, Dolce & Gabbana chose drones over humans to carry its handbags down the runway at the 'Secrets & Diamonds' eveningwear event during Milan fashion week. A fleet of around 7 drones hovered along the runway, each one with a Dolce & Gabbana handbag hanging beneath it. The fashion show was named 'Devotion' and features heart-shaped closures, and the flying bags made a bit of an impact on the audience, mainly because it meant imposing a strict no wi-fi rule for feat it might interfere with the spectacle. Dolce & Gabbana was satisfied, the drones flew out over the runway with some members of the 600-strong audience impressed by the copters, complete with propeller guards, made their way along the catwalk. Meanwhile, two presumably crash control members of the team loitered up and down the runway in case something unexpected happened, like some audience member sneakily switching their wi-fi back on creating a transforming the fleet into a flock of wild and threatening weapons… we can confirm this did not happen. Have a look at the video below, and continue watching if you are interested in seeing the rest of the show.